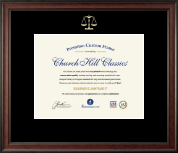 Choose one of our law certificate frames, then customize and make it your own! You’ve worked hard to establish yourself in the legal industry. 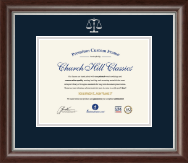 Whether in the capacity of lawyer, paralegal, litigation support professional, legal secretary, or legal consultant at your firm, your academic and professional credentials deserve a place of honor on your office wall. 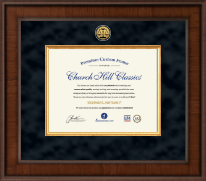 As custom framing experts, we handcraft document frames with “legal ease”—select a law school diploma frame bearing the legal insignia gold medallion or certificate frames embossed with the silver or gold scales of justice. 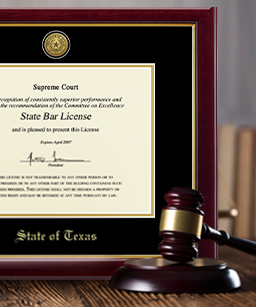 It’s easy to order law frames for certificates. 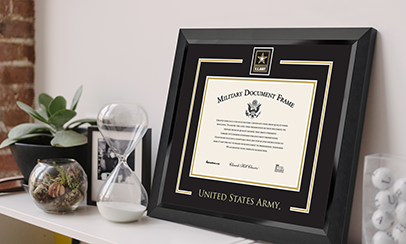 Simply click on one of our featured framing options and order! 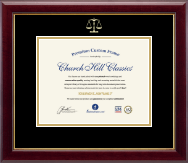 Or, use our custom online framing tools to change the moulding, mat colors, and glass style to suit your law office decor and personal taste. 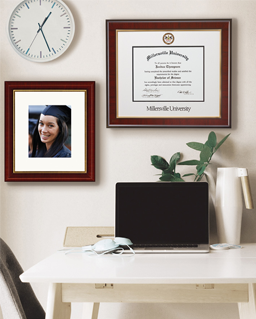 Customize to your heart’s content before buying your degree frame—your complete satisfaction is guaranteed! Not sure what to get your legal eagle as a grad gift? 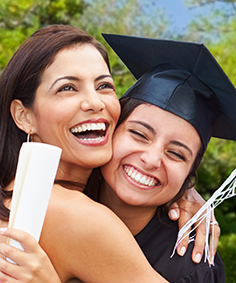 Let them buy their own personalized graduation frame with an eGift Card.